"UltraTimer by Plain and Simple Software is an ideal tool if you want to use your iPhone or iPod touch to keep you on track... UltraTimer is a simple but valuable tool for anyone who requires a flexible, hands-free event timer." "Ultratimer: a must-have for interval training. ... Of the timers that I've tested, UltraTimer is my favorite. Its combination of ease-of-use and functionality make it the benchmark fitness timer app." "So I purchased the UltraTimer app from the AppStore on my iPhone. It was the only purchased app I have that was worth it!" "...the other thing that I have come to love is my Ultratimer application on my iPod... the Ultratimer is a step beyond." "UltraTimer iPhone App Is EXACTLY What I’ve Been Looking For. ... I was worried that it might be difficult to use, but I found it incredibly easy and I was running with a program that only took me about five minutes to program, and that included recording the voice prompts." 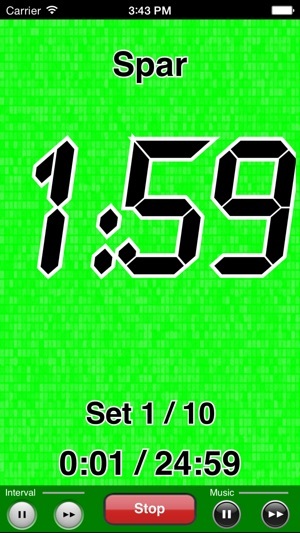 UltraTimer is the original fully-programmable and customizable interval timer in the AppStore. As a result, it is the most refined and feature-rich interval timer today! UltraTimer is an easy and convenient way of timing any activity or series of activities. You can set a single timer or multiple timers, each including series of count-down intervals that run back-to-back. 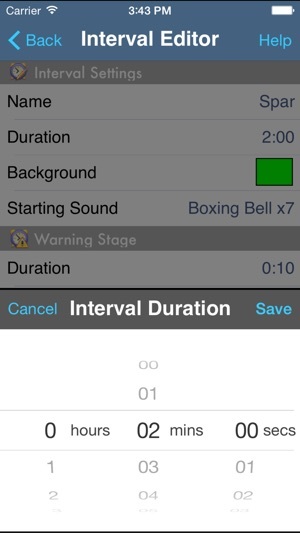 Each interval can be customized to play a different alarm sound from the included library, as well as change the background color for visual feedback. 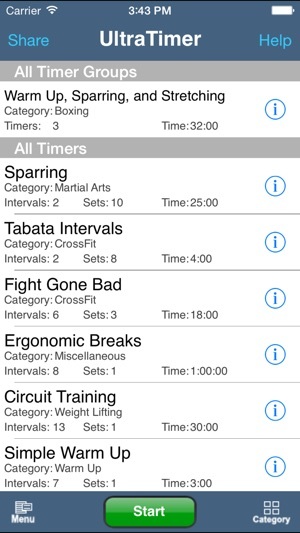 It is easy to set up intervals for any activity: training (martial arts, boxing, mma, circuit training, interval training, Crossfit, HIIT / HIT, yoga, meditation, exercise, workout, cycling, running, etc), time management for switching between multiple projects, or anything else you can think of. For a complete workout, you can set up a Timer Group which will play individual timers back to back. Start out with your favorite Warm Up timer, then run through your favorite Training timer, and end with a Stretching timer. UltraTrainer will run you through your full workout automatically. The included sound library comes with a wide variety of reminder sounds suitable for relaxing timers, high intensity activities, and everything in between. 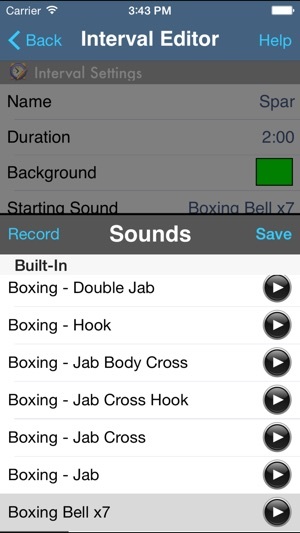 Custom sounds can also be recorded via the microphone; you are not limited to the included sound library. Exclusive to our products, users can browse the Timer Exchange, a community where people freely exchange timers. Search, browse, and download timers that other users have uploaded. If you want, you can upload your own timers to share with others. If a friend also owns UltraTimer, you can exchange timers via e-mail or the clipboard to use other methods. Using UltraTimer with music playing is not a problem. You can begin playing music on the timer screen, pause it, or skip to the next track. If you're looking for an App that coaches you as you train, check out "UltraTrainer." I’ve used this timer for a fairly long time now. I really appreciate its flexibility and the variety of times included. It wasn’t formatting well and hadn’t been updated for a while. I am grateful that it is back in play. Thanks! I works great again. I love this app so much. I just plug in my headphones and hit the gym. My trainer gave me exercises on this when I first started with him, but now I add my own. Please don’t ever stop updating this!!! I’d be lost without this! This version crashes frequently. The ability to import and export timers seems to have gone away. Trying to access the timer exchange results in an instant crash.